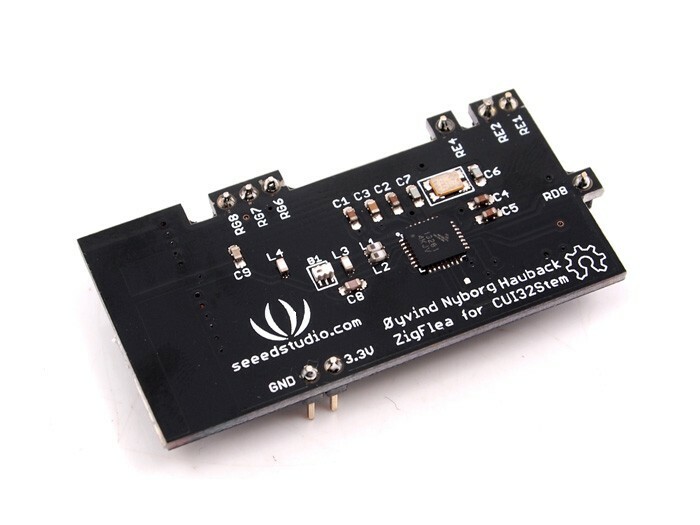 This ZigFlea board is a wireless transceiver "shield" for the CUI32Stem. Based on the Freescale MC13201 transceiver, which supports the IEEE 802.15.4 standard used by ZigBee and ZigFlea. Serial Peripheral Interface (SPI) pins are provided as standard, with the layout matching the CUI32Stem pin locations. The transceiver runs at 2.4 GHz and has support for 16 channels and a speed of up to 250 Kbps. ZigFlea is a subset of the ZigBee protocol, as implemented in StickOS. It equals ZigBee regarding the physical layer, but is a point-to-point protocol focused on sending in only one direction at a time (half-duplex). The benefit of this is that the protocol stack is as little as 3 KB, as compared to the 30 KB for ZigBee (which includes multiple hops and other features).